Make sure your expert knows about this Rule before he starts his investigation. Particularly the sub-section on the content of an expert’s report. (Ref. 1) Abiding by the Rule, as required by the judicial system, may increase the time spent gathering data – the forensic engineering investigation, and also the time spent analysing the data and writing the report. Increased time means increased cost. This is possible – higher costs, for the small to medium size forensic investigations typical in Atlantic Canada and I suspect across the country. Certainly when these investigations are complex. Experts are unlikely familiar with the Rules in the same way that lawyers are unlikely familiar with the expert’s field of practice. Engineers sometimes investigate a failure or an accident and report the cause but stop short of a detailed description of what they did. Particularly the technical analysing and reasoning lest counsel’s eyes glaze over. Many lawyers just want an answer – “and spare me the details”. This might be the case when the engineer is retained as a consulting expert rather than a testifying expert. Knowing about the Rule and that it requires more comprehensive reporting doesn’t mean estimating the cost of the forensic investigation is any easier. (Ref. 2) It just alerts counsel and the expert to the information that must be reported and that costs may be higher. The expert’s report, according to the Rule, must include everything the expert regards as relevant to the expressed opinion. This approximates a full engineering report. Identify and describe in detail the steps and tasks carried out during the investigation and the purpose of each. Describe any research carried out. List and describe the data obtained from each task. Analyse the data from each task and any research – its nature, what it means, how the data from the different tasks are related to each other, and how each is related to the failure or the accident. Fully explain the reasoning leading to the opinion. Describe a test(s) to formulate or confirm the opinion. State the degree of certainty with which the opinion is held. State any qualification put on the opinion because of the need for further investigation or for any other reason. Reference all the literature and other material consulted in arriving at the opinion. List the documents and other information acquired to prepare the opinion. This is comprehensive reporting. It takes time and it can be expensive particularly in a complex case. But the Rule also requires that the expert’s report draw attention to anything that could reasonably lead to a different conclusion. If “drawing attention” to “anything” means identifying and investigating other interpretations of the data, or follow-up investigations, then including the listed information on these things takes time. It may not mean exhaustive investigating and reporting but even a little more adds to the cost of an expert’s opinion.. Experts may not expect such comprehensive report requirements. It’s important to give an expert a heads-up at the time he is being retained and before he starts his investigation. I was given a copy of this rule by counsel shortly after it was published - after I had carried out a forensic engineering investigation but before I had written my report. It turned out okay but we like to know about such requirements before we start an investigation. Forensic engineering and insurance investigations can sometimes get quite “messy”. We can easily identify the different stages in standard investigations – the protocol we must follow to carry out a thorough investigation and to conform to good practice. But we can’t necessarily identify all the tasks involved at each stage and the length of time to complete each one. Nor where the evidence will lead us and the need for follow-up investigations. All of this impacts the ease/difficulty estimating costs which adds to the “messiness”. This is often the case when the natural environment is involved in the failure or accident. Such as in foundation and earthworks’ failures, landslides, floods, fuel oil spills, traffic accidents, and occasionally slip and fall accidents. There’s pattern in nature that we often need to look for and characterize in determining the cause of these types of failures and accidents. But Mother Nature doesn’t reveal herself readily. the surface water and the ground water below the surface. the physical properties of the different layers. how the ground water flows beneath the surface. There’s often pattern in these elements of a site. Based on a review of published topographic, geologic, and hydro-geologic mapping, we hypothesize its nature at the start of a forensic engineering or insurance investigation. But, Mother Nature lies in wait. If there’s one thing I learned as a civil engineer specializing in geotechnical and foundation engineering for a number of years, it was to “expect the unexpected” in attempting to characterize the foundation soil conditions beneath a site. You can’t see the thing you’re investigating. Also, ”if in doubt go deeper” with your investigation. I acquired the former bit of wisdom in the U.K. and the latter in Australia where I practised for a time. 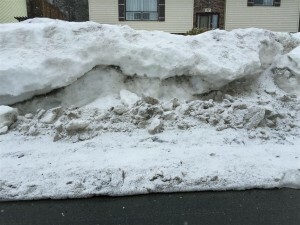 “Mess” came to mind in connection with this difficulty when I was walking my dog recently just as a last snow storm was starting – “last” would be nice, but we’re not holding our breath in eastern Canada. 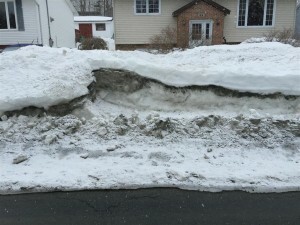 I was struck by the pattern – quite messy at some locations, in the layers of snow plowed up along the sides of the streets. The different layers would be different snow storms and we’ve had quite a few. 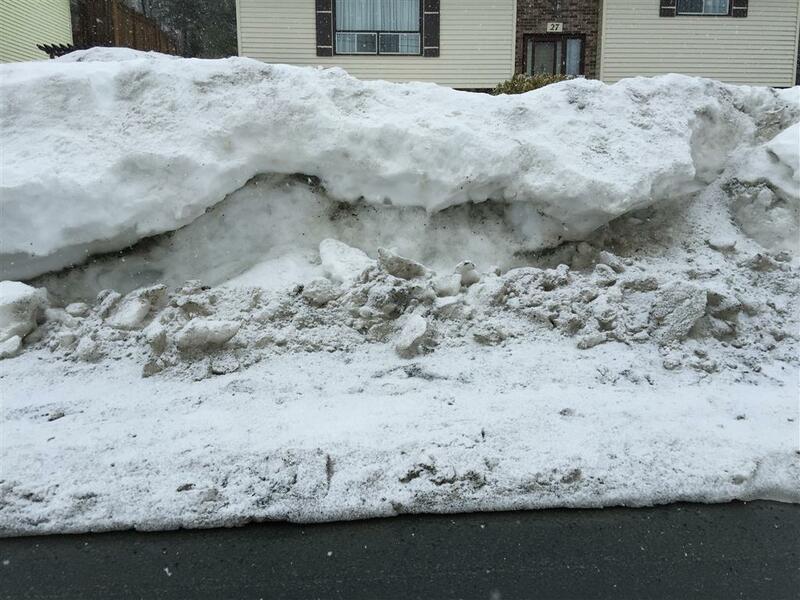 What I saw in the snow was illustrative of layers of soil. 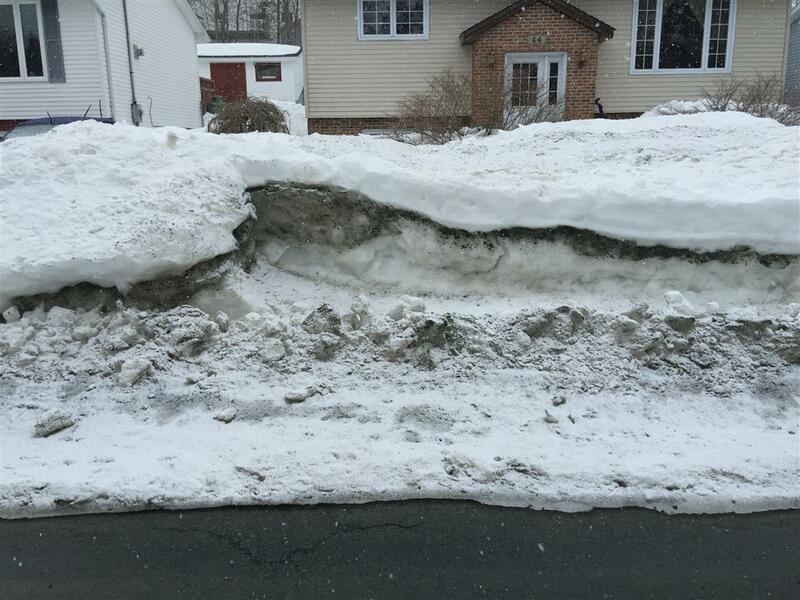 Soil is deposited in layers like snow and can be just as uniform or irregular like that seen in the snow banks. And just as “messy”, irregular, and difficult to describe and characterize, and difficult to cost. I took a few pictures and include a selection of these below – Figs 1 to 5 in the Appendix.. The pictures are two-dimensional. It’s very important to remember that the irregular, messy pattern continues in the third dimension as well. The layered patterns seen in Figs 1 and 2 are quite uniform. Those in Figs 3, 4 and 5 are irregular and messy. Similar “messiness” must be expected – as an initial hypothesis, to permeate all forensic work where the natural environment is an element in the problem. For certain, the environment below the ground surface. But often enough that above as well even though we can see the surface. And this “messiness” must be expected to confound our efforts to identify all the tasks that will be necessary during a forensic engineering and insurance investigation, the time to carry out these tasks, and their cost. Invaluable, is the best way to describe this forensic method. Drones fitted with cameras taking low-level, aerial photographs and video at the scene of an engineering failure or personal injury accident. It`s proving to be just that – invaluable, during a forensic engineering investigation. I blogged on this method last year, January 15, 2014. (Ref. 1) I’m even more enthused about the technique now. I’ve used this photographic method twice in the last few months to gather data and to document conditions at sites in eastern Canada. I understand the RCMP are using drones fitted with cameras to photograph traffic accident sites. I`m sure in other ways as well. I can imagine they are as enthused as I am. Typical low-level, oblique aerial photographs are shown in the Appendix. I’ll definitely take aerial photographs at the site of the next slip, trip, and fall accident that occurs outdoors that I investigate. Also flooding and drainage problems, and fuel oil spills. For that matter, I’ll take aerial photographs and video of the scene of any failure in the built or natural environment when the failure is comprised of some outdoor elements. Also photographs of features of interest on the upper levels of structures both outside and inside – where the structure is large and open inside and suitable for flying a drone. Low level aerial photographs are a big step up – no pun intended, from forensic engineering terrestrial photographic practice in the past. For example, old methods from past civil litigation cases…. I used binoculars not too long ago to examine the condition of the second and third levels of a building. Ice had fallen from the building and seriously injured a pedestrian. Boom trucks have also been used to facilitate this type of examination. I`m sure people have repelled down the side of a structure from the roof or upper levels to do this. I used a boom truck and a sea king helicopter during one forensic investigation to film the re-enactment of a fatal motor vehicle accident. Most of the photographs and video taken during my recent cases were oblique – tilted at an angle to the horizontal, but some were vertical. Tilt is adjusted by the pilot during flight. The photographs are taken with cameras mounted on a small drone – in this case a four rotor, quad-copter, flown remotely by the pilot on the ground at the site. The drone is also fitted with an altimeter to record height. There are six and eight rotor drones available. More rotors increases the control and stability of the drone and the on-board camera. Heavier, higher quality cameras with increased resolution can be carried by drones with more rotors. Specific view of the site wanted - front, back, side, etc. In my cases, most photographs and video were taken at 45 to 55 metres, some were at a few metres, and one was close to 100 metres above the site. The photographs and video are down loaded to a disc for use by the forensic engineer and client. You get 100s of aerial photographs of a site using this technique. It takes much more time to review, select, and study the photographs for evidence than it does to take them. It took two to three hours to fly and photograph each of the sites I’ve investigated recently. I’m experimenting with this method – it’s new to forensic engineering, and I’m trying new things and I`m liking the results. This time at one of my sites I took high – several 10s of metres, distant photographs from different angles to show the general setting – the context of my site and it’s problem. Then I took close-ups at a height of a few metres showing the specific location of the problem I was investigating. Also at one of my sites this time I marked the location of features of interest on the ground with sheets of white paper that would be visible from the air. These important features would not stand out otherwise. I also noticed important features on studying the aerial photographs of one site – unexpected, forensic engineering data, evidence, that would not have been seen on the ground. This data will be quite valuable in my assessment of the problem at this site. In future experiments, I will investigate increasing the accuracy of scaling distances from the photographs – a task of interest often enough, by setting horizontal control markers on the ground before photographing the site. I also want to investigate distortion in low level, vertical photographs. This distortion is seen in trees and vertical structures leaning away from the centre of an aerial photograph, which, of course, they don’t do in real life. Finally, at present, maybe investigate measuring the contour of the ground surface with a stereo pair of low level aerial photographs. Other experiments are certain to occur to me. Another just occurred to me as I was checking this blog before publishing. These low level aerial photographs will be good for terrain analysis and evaluation of the small compact sites typical of engineering failures and accidents. Terrain analysis is a valuable technique in geotechnical and foundation engineering investigation for a preliminary assessment of the soil conditions beneath a site. This photographic technique is easy and inexpensive – hundreds of dollars compared to thousands. I can easily imagine that low level aerial photography will be standard fare in the future. Like terrestrial photography during many initial visual assessments where an element in the forensic case is the terrain at the site of a failure or accident. There is a bit of a learning curve for viewers of oblique aerial photographs because we are not use to seeing a site this way. But a curve we quickly climb when we see the advantage of these photographs and the additional evidence that can be got from them. It seems important for your next problem, engineering failure, or personal injury accident that you ensure your expert is familiar with this forensic engineering method. The first aerial photograph was taken from an altitude of about 50 metres. The second, close-up was taken from about 4 metres. 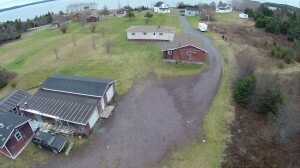 The two black, barely discernible dots in the first photograph to the right of the long white building and just across the gray driveway are me and the drone pilot, Robert Guertin, Dartmouth. Recently, I was researching practice for the forensic investigation of a personal injury accident, and standards for evaluation of the results. The practice and standards were not so well defined and somewhat silent, respectively, – obscure investigative practice and not well established standards in eastern Canada, better in the U.S., in both respects, and better still in Europe. Research a year and a half ago of industrial practices, as distinct from investigative practices, of a similar accident identified 11 different potential parties involved in design and construction of the component of the structure responsible for the accident. These kinds of situations cause forensic engineers and experts – and counsel by extension, lots of headaches. My recent research was identifying engineering literature and bringing it in by inter-library loan for review. Engineers know a lot but we must sometimes research a lot - poorly defined fields of practice for sure. One “engineering” handbook – the title wasn’t clear – turned out to be a legal practice handbook on this particular type of accident. What the heck, I thought, I’ll look through it. Imagine my surprise when I saw the handbook identifying and discussing the technical issues in these types of accidents. The discussion was from a legal point of view but the perspective was very informative to an engineer. The legal handbook was dated – 1983 to be exact, but at least I had a heads-up on a different way to view these technical issues. And a better feel on how to explain the investigative findings on these issues to the judicial system and counsel. I checked a quite extensive bibliography in a very comprehensive, 2nd edition, 2010 engineering handbook that I’m reviewing on this type of accident. I was delighted to see a well recommended reference – by an engineer, to a more recent legal handbook on the subject – by an author qualified as both a lawyer and an engineer. I checked and the handbook was available, and better still, in a revised and updated 8.5 by 11 inch, 613 page edition, to July, 2012 – quite an up-to-date tome. I’m now reviewing this legal material in connection with my cases. Even the 1983 handbook because the engineer in me saw not so much change in the basic relevant technical issues. This type of accident is still a somewhat obscure field of study and, as a result, a difficult accident to investigate, but at least I’ve got comprehensive and up-to-date literature on another way of looking at the problem. So, what’s the take-away? For forensic experts, and counsel too, check out the legal practice handbooks on the engineering failure or personal injury accident you’re investigating, particularly handbooks on poorly defined fields. Look at the perspective the legal profession has on the technical issues. To some extent, you’ll know the obscure fields by the dearth of information on practice and standards. I include “counsel too” because – with all due respect, I sense in my work that some of you have so many files open – I’ve heard “dozens”, “hundreds”, depending on the lawyer I was chatting with, that it surely precludes taking the time to check the handbooks for the relevant technical issues in a case. If your expert doesn`t know about this excellent resource – your legal practice handbooks, like I didn’t until recently, tell him and bring him up to speed. He’ll benefit and you will too by his more informed investigation..
A bonus in checking your legal handbooks – you’ll gain some appreciation, and not be surprised, at the lengthy forensic investigation an expert must sometimes do, particularly in the obscure, poorly defined fields of practice. We learn when things fall down or don’t work as they should. We learn from mistakes - our own as well as those of others. I see these lessons in the engineering failures and personal injury accidents that I investigate. There is an element of judgement in the practice of engineering. Particularly those engineering disciplines based on the semi-empirical sciences. Disciplines like geotechnical, foundation, earthworks, environmental, and hydraulic engineering. Good judgement comes from lessons learned. We also learn when things stand up - when we get it right, particularly from structures that are still functioning after many years. Things that stand up and work for a very long time. The Canal is a hydraulic structure. It connects 18 mile long Porter’s Lake in Nova Scotia to Three Fathom Harbour on the eastern shore. You cross it when you travel highway 207 between the communities of Seaforth and Three Fathom Harbour. It forms an unofficial boundary between the communities. Porter’s Lake Canal is a little more than 0.5 miles long and was designed to be six feet deep at mean low tide. It’s also pretty enough when you paddle or hike it’s length. It looks like a hockey stick from the air. 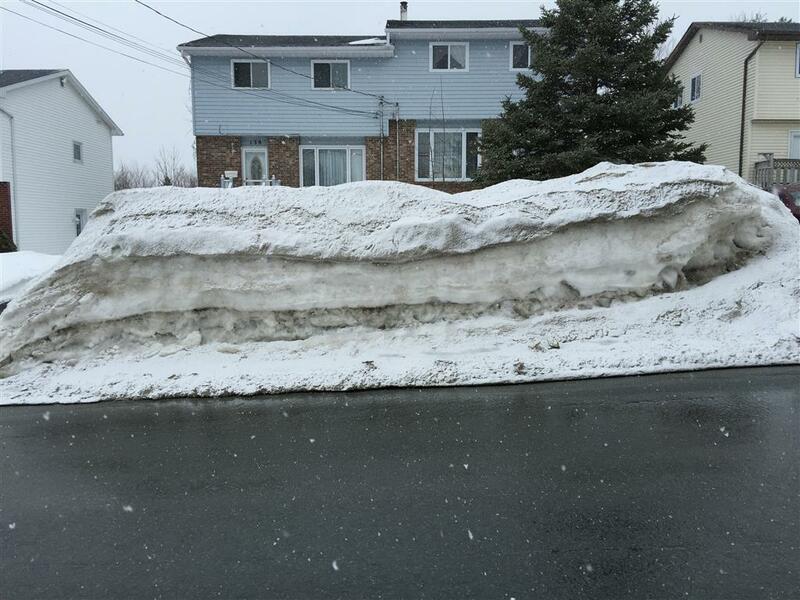 Can you get any more Canadian, more Nova Scotian than that? The Canal’s straight alignment stands out as an unusual feature in the landscape from several thousand feet aloft – go see, obtain a published aerial photograph of the area taken from 6,000 feet (at the Geomatic’s Centre in Amherst). I’m sure it would stand out on the moon with a good telescope. It was planned, designed and constructed by the community, engineers and builders in the late 1800s. The Provincial Engineer reported on the feasibility of the Canal in 1878. It was intended to provide better and more reliable access to the sea from Porter’s Lake for quite small coastal schooners - and markets for the natural products along the shores of the lake at the time. Rocky Run, the natural access to the sea from the lake, kept filling up with gravel from the action of the surf and the heavy seas of the Atlantic Ocean. It was dredged several times. The Canal hasn’t filled up in all those years, a main requirement the engineers had to meet. Engineering judgement would have been important in selecting Three Fathom Harbour as the location of the discharge end of the Canal, also in designing the slope of the Canal sides and the depth. Scour and erosion, long shore drift, and slope stability are quite empirical engineering studies even today. The lesson learned is that engineering judgement and somewhat un-glamorous empirical knowledge are valuable elements in designing and building structures that can last a long time. A very long time – witness the still functioning Roman, multi-level, bridge-like aqueducts. 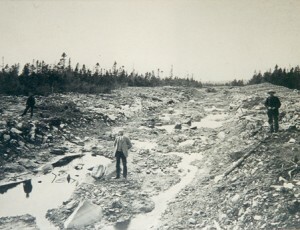 Like the Shubenacadie Canal in Nova Scotia of similar vintage, the Porter’s Lake Canal wasn’t used to the extent intended for similar reasons - new technology overtook both of them. A bridge constructed over the Canal shortly before 1915 to carry the railway to Upper Musquodoboit was too low for even small coastal schooners to pass under. Porter’s Lake Canal as a commercial venture was doomed at that time. There are photographs of the Canal In Appendix 1 and additional, quite interesting historical information in Appendix 2. The first photograph is of a paddler preparing to canoe the Canal. 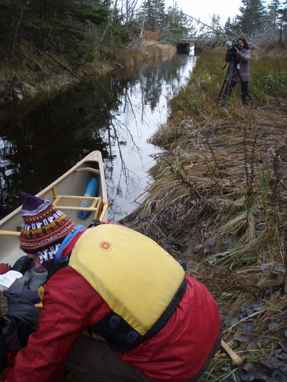 CBC TV did a feature story on the public’s efforts to save the Canal. The photographer in the middle distance is likely with CBC TV. 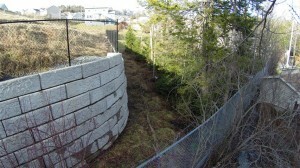 The second photograph is a view of the Canal from the Canada Trail where it crosses the Canal. Hwy 207 is in the distance. The third, rare photograph is of the Canal under construction. Much of the information on the Porter’s Lake Canal including the photographs has been provided by Dusan Soudek, Halifax, an avid outdoors-man, who, I think, has a day job in medicine. It was Dusan, possibly assisted by others, who located the following published items from the The British Colonist 1871. My initial thoughts on the Canal on reading some of Dusan’s material is also included below. It’s all quite informative reading on a very interesting engineering structure right under our noses – a short distance outside of Dartmouth. The value of this great improvement is not generally understood. It may be briefly, summed up as follows. Porter’s Lake is about eighteen miles in length, and surrounded by farms and woodland, and there are large quantities of building-stone and sand, all of which would prove valuable sources of wealth, if vessels of moderate tonnage could have free access to the ocean. But, unfortunately, the natural outlet from the lake is directly from the open sea-board, and, from the action of the surf, is being constantly filled up with gravel, although it has been dredged out several times. By cutting a canal from the lower part of the lake to Three Fathom Harbor, an outlet would be obtained which would never be liable to be choked up, as the harbor is sheltered from the heavy seas of the Atlantic. The distance from the lake to Three Fathom Harbor is a little over half a mile, and from the nature of the soil could be cut of the depth of seven feet, which is as deep as is necessary, for an estimated sum of two thousand pounds. Were this accomplished, the whole of the great resources of the surrounding district would be developed, and the value of all the properties enhanced. For many years the residents have been hoping to obtain this important boon, but without success. We are happy to know, however, that at length they are in a fair way to secure it. The residents of the district signed a petition to the Dominion Government asking for aid towards the work, which the Government have promptly responded to by sending an engineer to make a survey and make a report on its practicability and probable cost. There can be no doubt of the nature of the report on both points. Mr. Fairbanks has already, at the request of the inhabitants, made a preliminary examination, and his report proves not only the entire practicability of the work, but the very moderate amount necessary to effect it – not probably exceeding 2 000 pounds. Should the Government Engineer’s report corroborate Mr. Fairbanks’s (of which there can be no doubt) the work will be undertaken and completed by the Dominion Government, and a great and lasting boon thus conferred on the people residing in that part of the county. This important public work is now demonstrated to be practicable. It can be constructed, and must be. The persons who sneer at the enterprise and regard it as an electioneering dodge would of course kill it off if they could. The matter is in the hands of the people. The Government Candidates with “Hon. William Garvie” at their lead continue to sneer at the Porter’s Lake Canal. They call it a “canard,” a “dodge,” an “invention,” a “piece of deception,” a “walking falsehood.” What more names they may have for it we do not know; but we know that the project is a wise one, perfectly practicable, quite within reach as to the means for its construction. We know further that the people most deeply interested in it, the inhabitants of the district, do not regard it as a “walking falsehood.” What do they or we care for second hand Theodore Hook stories? We are grappling with practical realities. We all know that the Canal will not be encouraged by the Local Government or its nominees. We do not wonder then that the people around Porter’s Lake are determined to support Messrs. Hill, Daly, and Geddes. thanks for your intriguing thoughts about the canal. I am sending you, separately, a rare photo of the canl while it was being excavated and my notes about its history. It is shaped like a hockey stick… Can you get more Canadian than that? You know, Dusan, the Canal is a quite striking engineering structure. Straight and true, covering a lot of ground, built by men long ago with far less sophisticated earth moving, mechanical equipment than available today. Not such a complex structure in engineering terms but still an old structure built by man. Not in the same league as the Shubie Canal but respectable enough, if for no other reason but that it’s about 100 years old, just a little less than Shubie. And it’s being used today. How many 100 year old engineering structures are being used today in Nova Scotia, other than a very few buildings, a very few wharves, and a few winding, twisting roads? We have two main environments that figure in the affairs of man, a natural environment and a built environment. This is a good example of a different structure in the built environment – something other than buildings, that represents the efforts of men. And don’t forget, mankind has the built environment and all the comforts associated with it – I know, some problems too, because of the engineering profession, and the forebears of engineering centuries ago, builders in general. And it’s an interesting structure that got built by our forebears. Unlike the planned canal across the Tantramar Marshes that didn’t go anywhere because it didn’t get built. But like the Shubie Canal that did get built. But, unlike the Shubie Canal in that, to some extent, it’s being used today to something akin to its intended purpose long ago. And it’s so striking from the air – in the aerial photograph, like an arrow shot across the landscape. A feature like that draws the attention of those of us aloft. You know, a structure like this – the Porter’s Lake Canal, just might show up on a photograph taken from the moon or Mars. And it would draw the attention of Martians because it is an unnatural feature. Bet your boots, someone is up there looking down on us. More seriously, but only a little, this structure does show up from some distance off in space; there’s no question about that. In view of that, I think, rather than abandon the Canal to real estate developers and someone’s bottom line, we should clear the forest growth back a little, just a little, so it is more visible from the air, be more inviting to paddlers, and be another feature that marks Nova Scotia as different from the rest of the east coast. Dusan, feel free to share my e-mail thoughts with others with the view that it might stimulate additional thoughts of theirs, sorta like in a brain storming session. think much smaller coastal schooners, not the Bluenose. it may have been meant for logs, too. There is a mention in the old documents that it was to be 6 feet deep at mean low tide. the road that crosses the canal is Highway 207, and the canal forms the unofficial boundary between the communities of Seaforth and Three Fathom Harbour. In my initial appeal I made a slight error. The concrete railway bridge that spans the canal has the date 1928 imprinted in it, so I assumed that the Musquodoboit Railway reached the canal in this year. In fact the line, between Dartmouth and Uppper Musquodoboit, was officially opened on July 1, 1915. The original railway bridge over the canal was a wooden trestle, to be replaced by the current concrete bridge later. I have some great news to report. In response to public feedback, Fisheries and Oceans Canada has taken the canal property off the market, giving interested parties some breathing room to make plans for the canal’s future. 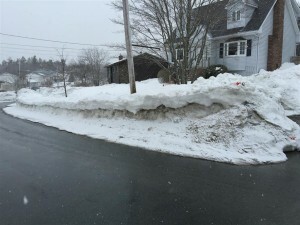 It was discussed at this week’s HRM’s Harbour East – Marine Drive ( i.e., “Dartmouth”) Community Council meeting and is on the agenda for Tuesday night’s (November 18) HRM Regional Council meeting. (Agenda Item 11.3.5). 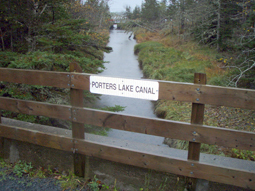 If you haven’t sent a note to the HRM Councillors re your support for keeping the Porters Lake Canal in public ownership and if you are inclined to do so, please consider sending a brief note to District 2 Councillor David Hendsbee at hendsbd@halifax.ca and to the entire Council at clerks@halifax.ca before noon on Tuesday. N.B. The sign on the former railway bridge that crosses the canal – see attached photo– disappeared sometime after Hurricane Juan..
Is there something that we should talk about that prevents carrying out a thorough forensic engineering investigation? Or at least acknowledge that it’s an issue? We counsel and forensic engineers and scientists, the justice system’s experts? I’m thinking that what needs to be talked about – the elephant – is inadequately funded forensic investigations and the reason for this. Actually, not so much inadequately funded investigations, but learning about the inadequacy after some preliminary forensic work has been completed and invoiced. Work like an initial reading of the documents and a visual examination of the site. Work at the real front-end of an investigation that identifies the key tasks that must be carried out to properly address the technical issues. For certain, the preliminary work sometimes indicates the direction an investigation will go – the likely cause of a failure or an accident, but that’s a bonus if subsequent investigation confirms the initial assessment. In a sense, there’s nothing wrong with having inadequate funds – there are limits to everything. We know that justice is expensive in our society. It’s finding out about this expense after the investigation has started – usually, at the very least, several months after counsel has taken the case, and sometimes – too often, years after. Suddenly, it’s learned that forensic investigation can be expensive. And this greater expense was not known when counsel took the case and assessed the worth of the file to the practice or estimated the costs to the client. Suddenly, the worth of the file or the client’s budget is being threatened. This is difficult to talk about. What happens then? Often enough, counsel decides against further investigation. Sometimes without finishing off with a simple calculation – a few hundred dollars in additional fees in one case I know of that would resolve a key issue and technically strengthen a case immeasurably. Another time without doing a simple high school averaging of measurements to quantify what both plaintiff and defendant observed during field tests. And, most sadly of all, a case where the technical data from preliminary forensic work clearly and easily demonstrated that counsel is suing the wrong party. Where did the elephant come from? The expense often wasn’t known because an expert wasn’t consulted about forensic investigative costs when the case was taken by the legal practice months or years before. The elephant was on the move then. All that was needed after that – to get the elephant in the room, was some preliminary forensic work and then an invoice. It doesn’t help when counsel estimates the cost of forensic work by looking at past expert costs for different cases, forgetting that you’ve got to compare apples with apples when assessing costs. You’ve got to know the tasks involved in an investigation and the cost to carry them out. These tasks and costs vary for the different kinds of forensic investigation. The fees for one of my cases was $1,300. My involvement quickly stopped the hemorrhaging of the client’s funds which had reached $140,000 for various experts in two years – engineers, a scientist, a land surveyor, and lawyers. All, including the lawyers, were being guided by one questionable, revenue-driven, technical “expert”. At the other end of the scale, fees and expenses for another case were about $83,000 to investigate the catastrophic failure of a bridge and permanent disablement of a driver. The site was a five hour drive from the office and several visits were necessary. Similar costs were incurred investigating the inadequate underpinning of a structure – the more we investigated, the more problems we found to be followed up on. But, another inadequate underpinning problem cost quite a bit less, about $37,000, to investigate and oversee repair. 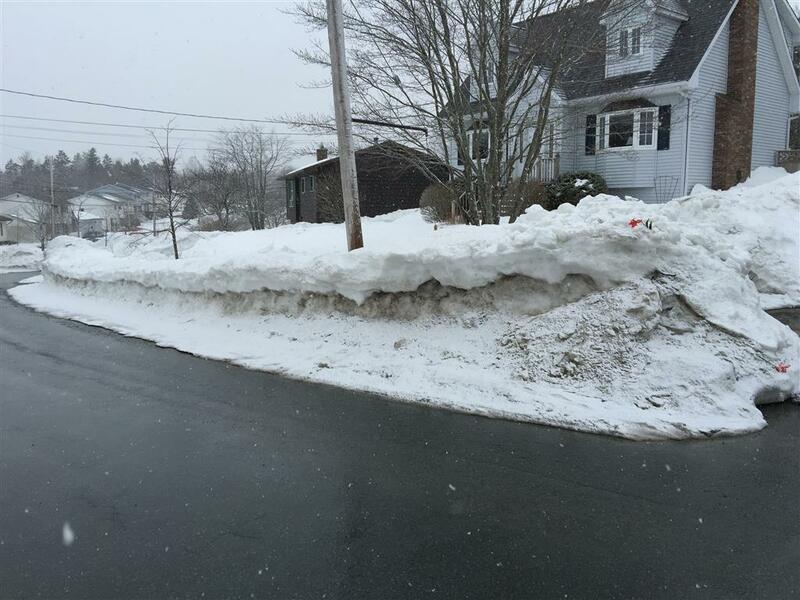 A landslide that affected several properties cost $44,000 in fees and expenses. A flooding problem, $10,500. The preliminary investigation of a fatal MVA cost $33,000 – just the preliminary work. But it was subsequently found that this work was enough to answer the one technical question: – did a pile of soil on the highway contribute to the accident? I was glad because the field testing was dangerous; I had put the testing on hold pending getting safety measures in place. If memory serves, a good many forensic investigations seem to cost between about $5,000 and $35,000. I’m sure experienced civil litigators handling more complex cases see a similar spread to the cost of experts, with the occasional rogue case coming in considerably higher – or lower. We are also required by guidelines published by our learned societies and associations, as well as by the justice system, to be thorough and exact in our engineering and scientific investigations. This takes time which must be taken into account when estimating the cost of a forensic investigation. If we don’t the elephant inches closer to the room. The same as counsel is required to take time and to be thorough in their legal investigations. This if the client is to be well served by the justice system. Sometimes – actually quite often, really, there is no case to argue or it’s weak until the technical questions have been answered. How do we get rid of the elephant, get him out of the room? How do we prevent the surprise of inadequate funds after some preliminary forensic work has been completed and invoiced? How do we prevent the threat this poses to the worth of the file to the practice or to the client’s budget? How do we prevent short-circuiting a thorough forensic engineering investigation? It’s not easy – the cost of forensic work is notoriously difficult to estimate. (see again Refs 1 and 2, also Refs 3 and 4) But retaining an expert at the time a case is considered – rather than months or years later, will at least get you informed advice on the cost of forensic work, including the difficulty estimating costs and the possibility of surprises later. Judge John Sopinka, Supreme Court of Canada, was clear about this in 1995 when he recommended: - retain an expert “…early in the life of a case”. (Ref. 5) This because of the complex issues that counsel, the courts, and the justice system had to deal with at the time, and just didn’t understand. Society is even more complex today. And David Stockwood Q.C. echoed this advice in 2004 in the 5th edition of his well regarded text, Civil Litigation: A Practical Handbook. If we do this – retain an expert early, the elephant will not get in the room. We will all be on the same page talking to one another about the real cost of forensic investigation early in the case. It was the breadth of the human failings that shocked me. Not the fact that human failings played a part in the collapse – they do often enough when a structure falls down. What troubled me is that they ran much of the gamut of our darker side, including incompetence and greed, and were exhibited by all parties involved with the mall in it’s 33 year life. If there is a common denominator in the human failings a case could be made for “money” being the one – getting and keeping as much as you can. Nothing wrong with money except when it blunts your moral and ethical fibre and gets in the way of doing the right thing. It`s not difficult to believe undue interest in money was there decades ago during the planning of the mall – the developer wanting the most structure for the least money spent. Then fast forward to a few weeks before the collapse when the engineer signed off on the structure knowing it was unstable - for certain with a view to being retained again and being paid for his services. And the undue interest in money on the part of the many private and public parties involved in the mall each year over the decades right up to the collapse. We can be excused for wondering how many other structures are on the verge of collapse that we don`t know about - due to similar human failings. We know about the mall because it fell down. There are bridges on the east coast that are in poor condition. But we know about these and the problem is being addressed. What about the structures that we don`t know about? I blogged a couple of years ago – shortly after the mall collapsed, about construction inspection and maintenance being the Achilles’ heels of project development, and touched on it again a few weeks ago. Inadequate construction inspection is almost like a default human failing. But this singular weakness in project development is not of the breadth and blatancy of the human failings that brought the mall down. We have our problems in forensic engineering investigation – a development project in a sense to an engineer, where investigations ”fail”, that is, they are inadequate because of human failings on the part of owners, counsel, and engineers. The parties often failing by taking little interest to understand what’s involved in forensic work and that thorough and objective investigations are expensive. We can’t always prevent the tragic effects of human failings on the built environment any more than we can prevent sick people murdering soldiers and shooting up our parliament. We must recognize and expect that these tragic events will happen – human nature being what it is, learn from them, and press on. It helps to focus on the fact that there are few structures in the built environment that are in grossly poor condition and on the verge of collapse. Fortunately, very, very few, I believe, knowing the engineering profession as I do. At the same time, however, to recognize that there are some structures in poor condition - but not about to collapse. Structures that are malfunctioning, performing poorly, and costing money that someone would like to keep and hang onto. What do forensic engineers investigate in Atlantic Canada? We investigate a considerable variety of accidents and engineering failures. No two are exactly alike. Also, our work is ‘small’ and ’medium’-sized as opposed to ’big’ and newsworthy. Not like the collapse of the Elliot Lake Mall in June 2012. Nor like the landslide in Oso, Washington in March of this year. We investigate tragedies like these but fortunately infrequently. The various failures and accidents also stretch across different engineering disciplines. For example, civil engineering and related specialities like foundation, geotechnical, and environmental engineering, and also structural, electrical, and mechanical engineering. Similar for civil litigators and insurance personnel? I can easily imagine that this variation is not too much different from the mostly no-two-are-alike, small and medium size cases civil litigators handle in Atlantic Canada. Also those files handled by insurance claims managers, consultants, and adjusters. I thought to blog on this question when I was recently asked by counsel to briefly describe some of the engineering failures and accidents that I’ve investigated. I noted 22 individual cases including a couple that were newsworthy. I was struck by the variety. To get some idea of the magnitude of the variation in forensic engineering investigation you might first look at a blog I posted a few weeks ago on the different ways buildings can fail - 34 and counting. (Ref. 1) The author of the book that prompted the earlier blog missed a good number involving the structural and foundation failure of buildings. Then think about the fact that a building is just one type of structure in the built environment that can have a problem. Our built environment comprises hundreds of different structures. For example, bridges, dams, wharves, roads, railways, embankments, transmission towers, power stations, drainage systems, retaining walls, and all the attendant infra structure and mechanical and electrical services. All have their long list of different ways of failing. A step ladder is a structure to an engineer. Also a pile of salt on the road, particularly if it’s a factor in a fatal motor vehicle accident. It’s not difficult to imagine with such an elaborate and complex built environment that there is also considerable risk for different types of personal injury accidents to occur, as distinct from failures. 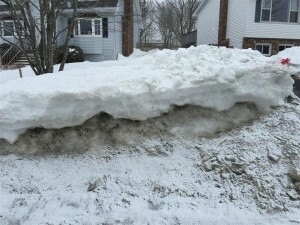 For example, there is an extensive literature just on slip, trip and fall accidents alone – many thousands of these types of accidents occur every year in North America, with a number of these in Atlantic Canada. All this variation might beg the question, “How can any one forensic engineer know how to investigate so many different types of failures and accidents?” Well, if we stay within our respective disciplines and specialties – civil engineering for me - we can do it. The basic investigative principles are the same within a specialty regardless the problem. I suspect the principles are also similar across the different engineering disciplines. .
What do we investigate in Atlantic Canada? The following categories of cases will give you some idea. The cases are selected from my files. Each category represents one to several cases. The Cases are described, in general, and the kinds of Technical issues that might need to be addressed are noted. No two cases are exactly alike as noted above, and some are very different. The floor surfaces in the slip and fall accidents are all different. And slip and fall accidents are very different from a soil-steel bridge failure and also different from toxic fumes in buildings. And these in turn are different from inadequately underpinned buildings, collapsing retaining walls, landslides, tunnel failures, and vibrating buildings. Most of the cases were in Atlantic Canada but two were at airports in the Bahamas. Four cases did not result in litigation but are quite illustrative of the variation in forensic engineering investigation. Floods: Cases Frequent land flooding and drainage problems, and flooding of nearby structures. (In addition, we investigate many basement flooding problems – too numerous to mention) Technical issues Generally, determine whether or not construction on adjacent properties caused flooding and an increase in drainage on adjoining properties. And, in one case, caused a three foot deep flood in the pump room of a recreational facility with a swimming pool. Inadequate remediation of fuel oil contaminated sites: Cases Suspected inadequate clean-up of contaminated sites at excessive cost. Technical issues Confidential interview of 11 clean-up contractors in Atlantic Canada to determine the problems with clean-up operations, the cause of the problems, and the cause and magnitude of cost over-runs. Collapsing fuel oil tanks: Cases Occasional situations are investigated where a structure is undermined by adjacent construction work. In one case, a domestic fuel oil tank collapsed into an excavation near the foundation of the tank. Technical issues Determine the reason why the ground gave way and undermined the tank’s foundations. Slip, trip and fall accidents resulting in injuries: Cases Slip and fall accidents in apartment buildings, recreational facilities, retail outlets, and on sidewalks. Technical issues (a) Appropriateness of the floor surfaces – the skid resistance, for the intended usage of the area. (b) Source of contaminants on floors – a factor in some slip and fall cases. (c) Maintenance of an area. Bridge collapses: Cases Occasional failures involving the collapse of soil-steel bridges – corrugated culverts spanning at least 10 feet in North America, as great as 20 to 25 feet in some locations in Atlantic Canada. Technical issues The cause of the collapse. And in one case, the flood level of the stream the bridge was spanning. Landslides: Cases Collapsing slopes – either catastrophic, a slow movement of a mass of material, or the simple sloughing of surface soil, all damaging other structures at the top, on, or at the bottom of the slope. Technical issues (a) The cause of the landslide. (b) Occasionally, design and overseeing stabilization of the slope. Toxic fumes: Cases Occasional toxic odours in buildings requiring closing off of a part of a building or vacating the building completely. Technical issues Determining the source and cause of the toxic fumes. Swimming pool failures: Cases Occasional failure of a swimming pool, for example, by movement of the liner. Technical issues Determining the reason a liner floated away from the side of the swimming pool. Excessive foundation settlement: Cases Frequent enough cases involving settlement of foundations damaging the structure above or affecting its performance. For example, in one case, rapid, excessive settlement of a swimming pool - many inches in a few months. And in another case, slow, excessive settlement of a processing plant – many inches in a few years. Technical issues (a) Determining the cause of the excessive settlement. (b) Occasionally design remedial work. Inadequately underpinned buildings: Cases Frequent enough cases of buildings not being underpinned properly during construction work to fix other problems. For example, the underpinning of a house associated with remediation of a fuel oil spill. Also the underpinning of an apartment building during construction of a second multistory apartment building on adjoining property. Technical issues (a) In some cases simply determining the adequacy of the underpinning. (b) In occasional cases, designing and overseeing construction of adequate underpinning. Airport runways: Cases A rare case where quite large holes – one to several feet across and deep, were appearing in the surface of a runway. Technical issues (a) Determining the cause of the holes – they turned out to be what are called ‘banana’ holes in the Bahamas. (b) Identifying a method to locate potential hole locations. (c) Designing remedial measures. Would I be perceived as biased? Would I be perceived as biased if I told counsel about literature that discusses both the technical and non-technical issues – including legal issues, of a problem in the built environment? A while ago, I was assessing the state-of-the-art of a science relevant to a case I’m working on. I was interested in the factors affecting the test results of a material property. Also the current understanding in science of this property and it’s determination. I was also interested in the development of various devices over the years to test/measure this material. And the accuracy and reliability of devices on the market today. For me, it was all about the science and forensic engineering. I was surprised in reviewing a technically, very up-to-date piece of literature on this material property to find it also addressing the interests of owners – and litigators who might be acting on their behalf, in connection with problems to do with such a material. This literature was current and treated both technical and non-technical issues very comprehensively. I was also surprised to find in a more dated piece of literature that it was all about the interests of the property owners, the users of the property, and their counsel – and very little about the technical issues. The title and abstract had misled me. So, here was very informative literature in which the parties involved in the case I was working on would be quite interested. And possibly the insight gained would resolve the dispute earlier. My role in this case was to serve the justice system with reliable technical data and an explanation of this data, and to do this in an unbiased, objective manner. Counsel’s role is to serve the best interests of their client. In a perfect world I should be able to inform all parties about this literature. I’m not sure what would have happened if I had informed my party, and so I hesitated. If I informed counsel and the information was not distributed would I be perceived as biased? If I refrained and waited until I was instructed to draft a report on the matter then I would reference the literature as a matter of course. That would seem to solve such a problem because a report is not usually requested by counsel unless they are comfortable distributing it. Maybe there was no question about bias. (Note: I posted this blog in June, 2014 to help counsel, the judicial system, and insurance claims managers and consultants understand how the standard of care is determined. To help you gain some appreciation of the technical issues in the stepped process that are understood by an expert but not so well by others. Also, to draw attention to how the assessment can at times be easy and inexpensive and at other times quite difficult. This is illustrated with two case histories. The following is based on the literature in the References, particularly Refs 3, 4 and 7 and my engineering experience in eastern, western, and northern Canada, and overseas. The literature emphasizes the process as it applies to professional people. I have extended it to include other specialties. Often when a building or a civil engineering structure fails, or a component is defective in some way, the performance of the parties involved is called into question. Did they exhibit the degree of care that a reasonable person should exercise? Civil engineering structures can be anything built by man. Also, anything in the natural environment that affects people, like floods and landslides. For example, any of those parties from the original owner of the building or civil engineering structure to the workers who maintained it. And all those specialities and trades in between. Like the architects, the design and construction engineers, construction and building trades’ workers, material and product manufacturers and suppliers, and product and equipment installers. It’s also the case – questioning the performance of the parties involved – when an accident occurs causing property damage, personal injury, or death. These are “standard of care” questions. 1. The expert determines and describes the standard of care existing at the time the structure and/or its components were designed, built or maintained, or the accident occurred. He or she determines what a reasonable person would do in similar circumstances. 2. Then the judicial system uses the description of the standard in assessing the actions of those associated with the structure or the accident scene. The judicial system may consider an expert’s opinion on whether or not the parties involved deviated from the standard. Being human, experts are susceptible to applying personal standards. They risk raising the standard of care by relying on their personal experience and practice. Litigation is retrospective. Usually an expert must determine what the standard of care was in the past, not what it is at present. If he did not practice during the time period in question, he would have to determine the standard by interviewing others and reviewing documents. Also, if there were a number of different procedures for getting something done at the time it would be necessary to determine the nature of each, and which one would have been seen as a standard. Again by interviewing others and reviewing documents. This is difficult and time consuming and involves a lot of e-mail, telephone, document, and leg work. There are unique services, and some quite ordinary, for which no standard exists. Experts retained to determine the standard of care must solve these problems. Although a protocol for answering the two “standard of care” questions above in every case does not exist, the following steps will at least assist the expert. They will also assist counsel and the judicial system acquire some understanding of the comprehensive nature of the process. Also the technical issues involved in determining the standard of care. Such a determination can be quite easy and straightforward in some cases, and quite difficult in others. This affects costs as might be expected. This is illustrated by two case histories described below. I developed the stepped process – by extending the one in Ref. 4 - to include workers in the various supply industries, the building trades, and maintenance, in addition to the professions. I found in researching the standard of care that much of the material concerned the performance of the professions. However, there are circumstances when the performance of others is of interest. Establish the time period involved. If there is reason to believe the standard is locality-specific, determine the applicable geographic locality. Determine the circumstances that relate to the failure or accident. Determine the technical cause of the failure or accident – the failure mechanism. Determine the process in developing the structure or component involved in the failure or accident – the procedural cause. Identify the professions, industries, and/or trades involved in the process and if they are well defined and understood as such. Review the contract, or any other documents that define the party’s scope of work and any limitations on their services. Perform a literature search to determine if the standard of care was documented in publications, manuals and guidelines, regulations, and/or codes. This literature should be known to representatives and workers in the professions, industries, or trades associated with the failure or accident. Interview a number of professional, industrial, product, and trade representatives to determine a consensus standard of care. If there is variance, speak with more until you are satisfied you know the average. Compare the consensus standard, as modified by contract, circumstances, or other justifications, with the questioned performance during design, construction, and/or maintenance of the building, civil engineering structure, or component. This stepped process is quite comprehensive. If followed it will assist the expert come to a clear understanding of the standard of care for a particular set of circumstances and enable the expert to describe it – answer the first of the two “standard of care” questions above. It will also enable the expert to formulate an opinion as to whether or not the actions of the parties associated with the failure or accident conformed to the standard of care at the time – the second question. Does the expert have the degree of learning and skill ordinarily possessed by reputable professionals, practicing in the same or similar locality, and under similar circumstances? Did the expert use the care and skill ordinarily used in like cases by reputable members of his or her profession practising in the same or similar locality under similar circumstances? Did the expert use reasonable diligence? Did the expert use his or her best judgement? Did the expert do all that in an effort to accomplish the purpose for which he or she was retained? What are “same or similar” localities and circumstances? What learning and skill are “ordinarily possessed”? What care and skill is “ordinarily used”? What is the expert’s “best judgement”? What was the purpose for which the expert was retained? Attentiveness: Caring about; noticing the need to care, or recognizing the need of others. Responsibility: Taking care; having more than an obligation, but a responsibility arising in part from one’s position or knowledge. Competency: Care giving; having the ability to carry out the caring act effectively and correctly. Responsiveness: Care receiving; being receptive to care, being aware of the care receiver’s perceptions. Large, complex structure but easy and inexpensive assessment of the standard of care: I assessed the standard for the catastrophic failure of a soil-steel bridge – a very large, corrugated steel culvert – that permanently disabled a woman. The assessment was easy and inexpensive because the design and construction process was well defined. There were only two parties to interview: (1) The one design firm working in the area at the time and (2) The culvert manufacturer. The assessment of the standard of care was easy even though it was a large, complex structure, the failure occurred about 10 years prior to my assessment, and the soil-steel bridge was designed and constructed about 35 years previously. Small, simple component but difficult and expensive assessment: Another assessment for a simple accident was difficult and expensive. This was because the industry and the process associated with development of the small component of the structure involved – a floor - was poorly defined and made up of 11 parties, with many persons to interview. The relationship between the parties, and who was responsible for what, was not well defined. It was expensive even though a simple component was involved and the accident occurred quite recently. Kardon, J. B. 2000, 2010 Chapter 7, Standard of Care in Forensic Structural Engineering Handbook, R. T. Ratay, Editor-in-Chief, McGraw-Hill, New York. Thompson, D. E. and Ashcraft, H. W. 2000, 2010 Chapter 9 Page 9.17 in Forensic Structural Engineering Handbook R. T. Ratay, Editor-in-Chief, McGraw-Hill, New York. Tronto, J. C. (1993), Moral Boundaries: A Political Argument for an Ethic of Care, Routeledge, New York. Kardon, J. B. (2005), The Concept of “Care” in Engineering. American Society of Civil Engineers, Journal of Performance of Constructed Facilities, Vol. 19, No. 3, pp. 256-260.